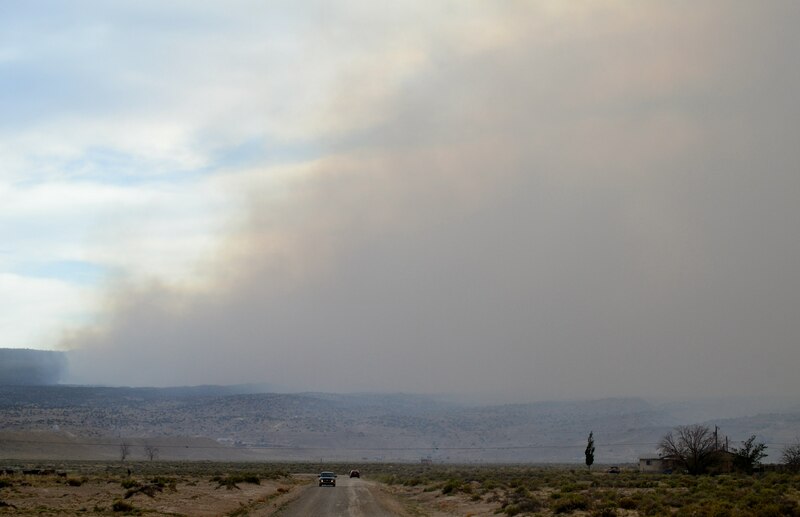 At about 7 p.m. today, June 16, 2014, the Assayii Lake Fire was zero contained and had burned about 11,000 acres of land to the northeast of Navajo, N.M., east of Crystal, N.M. and west of Sheep Springs and Naschitti, N.M. The fire started on Friday the 13th in the Camp Assayii recreational area, which is northeast of Navajo, and was human caused. It is under investigation. 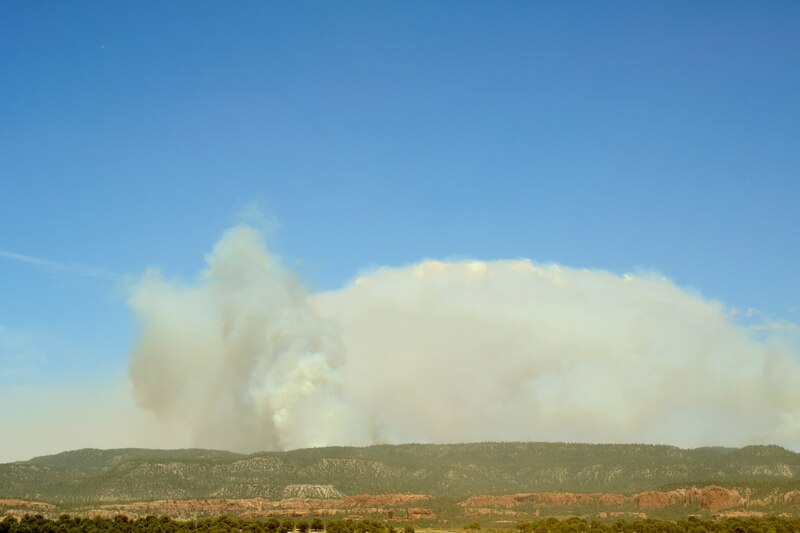 At about 9 a.m. today, June 16, 2014, Southwest Incident Management Team 3 members reported that the fire had consumed about 2,000 acres of pinyon pine, juniper and brush. But by 1 p.m., SW Incident Team members reported to community members at a public meeting at the Crystal Chapter that the Assayii Lake Fire had blown up to about 11,000 acres. When a wild land fire is reported as zero contained that means that it’s totally uncontrolled. Southwest Incident Management Team 3 Commander Bea Day compared the Assayii Lake Fire to a run-away horse during the public meeting at the Crystal Chapter today, June 16, 2014. The comparison of the fire to a run-away horse and the fire being at zero containment on the fourth day of fire is due to extremely high winds that are driving the fire from the Camp Assayii recreational area and over the Chuska Mountains to the Navajo Reservation communities of Sheep Springs and Naschitti. According to today’s weather report, the winds along the Chuska Mountain ridge top and in the valleys started at about 11 to 17 miles per hours and then increased to between 18 and 25 miles per hour with gusts between 33 and 42 miles per hour. The weather forecast on Tuesday, June 17, 2014, shows southwest winds at 25 miles per house, with gusts up to 45 miles per hour. On Wednesday, June 18, 2014, south winds are expected to be at 20 miles per house, with gusts at 35 miles per hour. By Thursday, June 19, 2014, the winds will be moving to the northwest at 10 miles per house, with guests of 20 miles per hour. Another view of the Assayii Lake Fire at about 7:30 p.m. on June 16, 2014, and about five miles south of Naschitti, N.M. Photo by Marley Shebala. Fire Information Officers reported today, June 16, 2014, that the high winds create a highly dangerous situation for the fire fighters because of the unpredictability of the direction of the fire. The high winds, combined with smoke, also has grounded air operations, which include helicopters and air tankers. Fire Information Officers also reported that a total of about 700 firefighters would be camped out in the area of the Crystal Chapter. Some of the Hot Shot crews that are fighting the Assayii Lake Fire are from the Navajo Nation, the Apache Nation, and Pueblo of Zuni. Hot Shots have also come in from Payson, Ariz., and Heber, Ariz. The road between Sheep Springs and Crystal, which goes through Narbona Pass has been closed for public safety reasons. Some community members and families from Crystal, Sheep Springs and Naschitte have been evacuated by the Navajo Nation police. Emergency shelters have been established at the Tohatchi, N.M., high school, Chuska Boarding School in Tohatchi, the public schools in Newcomb, N.M., and at the Sheep Springs Chapter. Sheep Springs Chapter officials said late this afternoon, June 16, 2014, that the Sheep Springs chapters would be open 24/7 during the entirety of the fire. Numerous community members at public meetings with the SW Incident Management Team in Window Rock, Crystal, Naschitti and Sheep Springs have expressed concern for their livestock, which they have at various locations on the Chuska Mountains. According to Sheep Springs chapter officials, the Navajo Nation Agriculture Department is working with livestock owners to remove livestock if possible. Fire Information Officers have cautioned livestock owners about removing their animals from areas that have been closed because of extreme fire danger that would jeopardize the lives of the livestock owners and lives of the firefighters that would be ordered to go in and rescue them. Community members were also advised by fire information officers to be prepared to evacuate at a moment’s notice. They emphasized to community members that the decision to evacuate them would be made by Navajo Nation law enforcement. Staff from the Fort Defiance Indian Health Services hospital and Navajo Nation Community Health Representatives informed community members that have asthma and other respiratory problems to be very aware of the negative health impacts of the smoke and ash from the fire. Fire Information Officers reported that public information about the Assayii Lake Fire is available from www.facebook.com/AssayiLakeFire and www.nwcg.inciweb.gov and local radio stations, such as KTNN AM 660, KNDN AM 960, and KGAK AM 1330. Fire Information Officer Peter D’Aquanni has been assigned to the Naschitti chapter. D’Aquanni can be contacted at 505-429-1060. Fire information is also available from the SW Incident Management Team by calling 928-362-1482 between 8 a.m. and 8 p.m. The SW Team is holding daily public information meetings at 9 a.m. at the Navajo Nation Museum in Window Rock, Ariz. 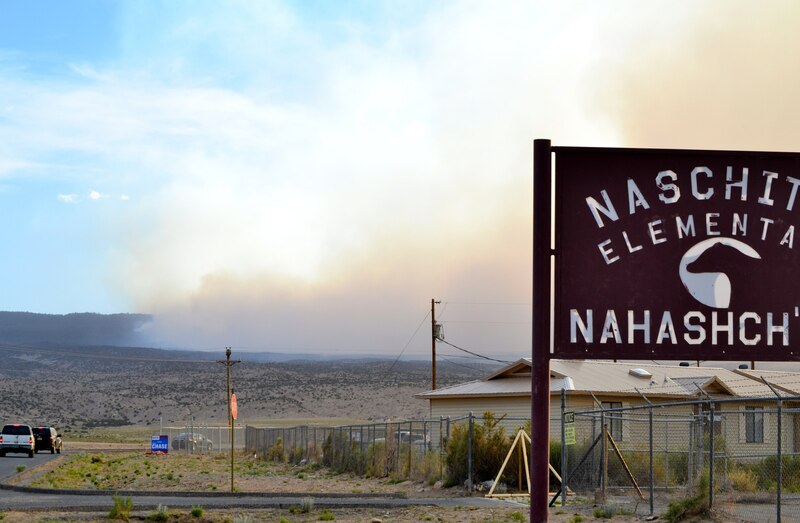 This entry was posted in Professional Journal and tagged Assayii Lake Fire, Navajo Reservation by Marley Shebala. Bookmark the permalink.